VAST Frequently Asked Questions - Pinktronix Terrestrial & Satellite Television Installation Services. What channels can I get with the VAST service? 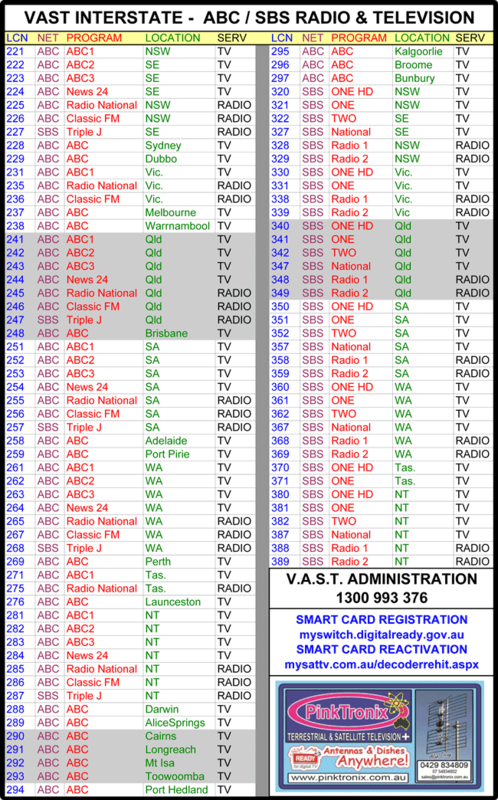 VAST is a Free To Air satellite service which essentially mirrors the terrestrial FTA service for each state or time zone. Local news is carried by a suite of 20 local news channels from four different media organizations. Channel four is a dedicated menu channel for the local news channels. 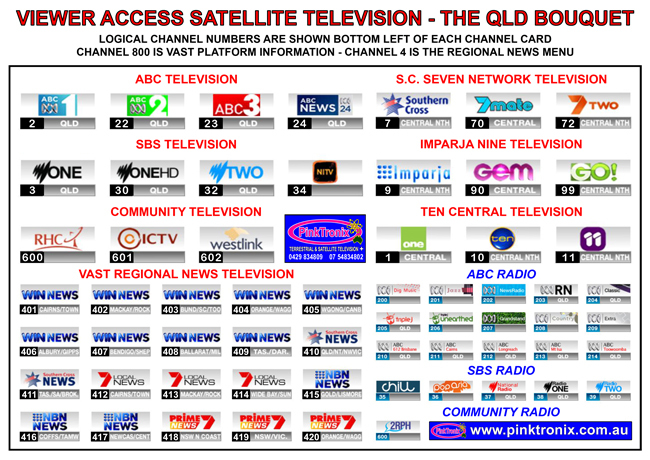 See viewer-access-satellite-television-1-overview for the current Queensland channel allocation. My FTA terrestrial is bad sometimes but I am not sure if it is because the antenna system is bad or because I am living in TV reception black spot. Can I still get a VAST service installed? 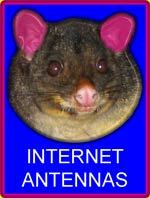 Yes, anyone can get a VAST service installed but you will only be able to receive the ABC and SBS channels unless you are in a VAST gazetted TV reception black spot or you register as a traveller. If your area has not been mapped as black spot, a case by case assessment will be made by the commercial channel authorities. See viewer-access-satellite-television-3-access-rules. What are the requirements and timing for having the commercial channels activated on VAST? Eligibility of the V.A.S.T. commercial channels activation is measured by two criteria, terrestrial signal strength at your location and application type. If you make application for a static installation but can receive terrestrial TV properly, you will not be able to have the commercial channels activated. If you make application as a traveller, you will have all channels activated but you will have to re-register every 6 months. Holder of legal RABS smart card........Typically within 24 hours. Gazetted black spot......................... Automatic, within 5 minutes. Ungazetted black spot .....................Fixed at 15 business days. Am I eligible for a government subsidy? No.The subsidy scheme is now closed for all locations and all income circumstances. The Satellite Subsidy Scheme is now closed in all areas. The SSS provided a subsidized installation of the equipment needed to receive the free-to-air Viewer Access Satellite Television (VAST) service. This included a satellite dish, a VAST-enabled set top box and associated cabling. It also included a 12 month warranty on equipment and installation. 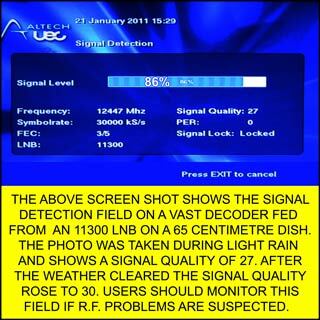 An eligible SSS area was one identified as reliant on analog retransmission services from a self-help TV tower which was not converted to digital. The subsidy greatly reduced the cost of getting ready for digital TV. • Eligible households paid a household contribution to receive the assistance. • The contribution was between $200 and $250, depending on the location. 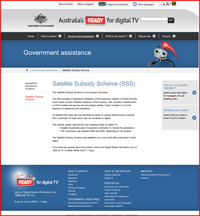 The Satellite Subsidy Scheme was available up to one month after switch over in each region. 1800 20 10 13 (8AM-10PM) AEDT, 7 Days. Can a VAST box plug straight in to an Aurora (Remote Area Broadcast Service) setup? Yes, but sometimes a configuration change is required. The VAST service now requires that a 10.7 wide band low noise block down converter (LNB) be fitted to the dish in order to allow reception of the full complement of VAST channels transmitted. Many of the older RABS installations have an 11.3 LNB fitted which will require changing if this is the case. What are the basic requirements for a VAST installation where no dish is in place? 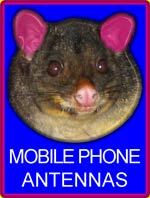 Much the same as for any satellite TV service. You will require a dish pointed at VAST satellites Optus C1/D3, a connection to a wall plate and a VAST decoder connected to an input on your TV. You will need to select this input and control VAST channel selection with the VAST remote. Go to viewer-access-satellite-television-4-registration for a guide to a typical DVBS installation. Can I reticulate my VAST signal to more than one room? Yes, but unless wiring is already in place, or cable runs from the decoder are short the best method is to have two separate decoders fed from 2 separate feeds from the dish distribution system. Does the new VAST encoder allow me to reticulate my VAST service to more than one room using the analog RF-out connecter the same as I could with the RABS / Aurora system? This model VAST decoder does not output the VAST channel to an RF channel the same as the RABS / Aurora box. If using the old DSD 4121 you will need an RF modulator like the one shown on the left to convert the VAST video signal to an RF signal suitable for reception on a common analog TV channel. Today, there are several decoders on the market but only one of them, the SatKing DVBS2-800CA has a built in RF modulator. The analog TV RF connectors are on the right side in the rear panel pic below. Unless wiring is in place, and you are really stretching the dollar, this is not the best way to go for distributing the VAST channels to separate TV sets. Why does the decoder freeze or began a rescan sometimes? The decoder may be faulty, but it also may be because of design limitations. 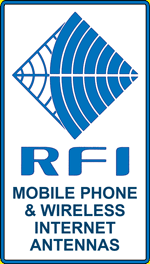 As well as being a radio frequency receiving device the decoder is also a micro computer. If the signal strength is poor because of storms or a less than perfect installation the signal strength will fall below the error correction threshold. Pixilation will begin and the box may flag a rescan as it attempts to reacquire the satellite. PinkTronix recommend 85 centimetres as a minimum dish size to mitigate the effects of inclement weather. Even with a larger dish, expect not to be immune to rain fade in heavy storms. 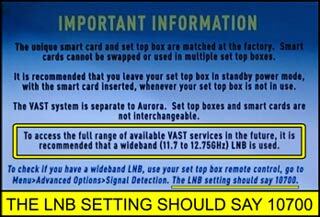 Users should consider a dish alignment check and the installation of a new LNB if the installation is fairly old. Often times the LNB is weathered and dish group is insecurely fastened and/or misaligned. As a fault finding tool users should monitor the signal level field and establish for themselves what are the normal operational parameters for their installation. For a given channel, note the level for flawless operation on a clear sunny day and also note the level at which the system starts to pixelate during heavy rain. If you record these figures, you will now have a handy fault finding tool to isolate any future problems. There should be parameter repeatability for a given weather situation. If the figures are not in the ball park under similar conditions, you may have dish stability/cable integrity/LNB feed problems. Like all micro computers the VAST decoder will have logic problems as unforeseen operational permutations present themselves over time. 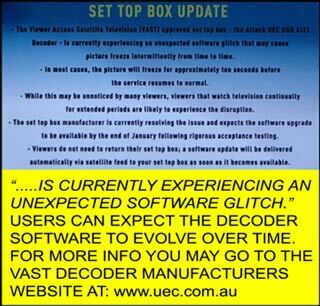 These may vary from simple glitches affecting a specific function to problems which present on all channels. The machine may hang from time to time the same as your personal computer or any other set top box, an occurrence which is recognized and planned for by the inclusion of a reset button on the front panel. Unless there is some major flaw in hardware design the manufacturer will address these problems by programming upgrades which will, for the most part be delivered via satellite download. Software upgrades can also be performed via the USB port. To learn more about this go to the manufacture’s website.